Henry’s story, hunting for the Candy Killer, Tilly at work. Plus, some comparisons between this episode and season 1 episodes as we pick breadcrumbs up from the episode and goes in-depth thematically in our full-discussion of 7×16 “Breadcrumbs”. Seriously, is someone writing this season with the “Author’s Pen” with the vial of “Squid Ink”? Knowing that the next episode is called “Breadcrumbs” when we met Gretel was interesting, except it helped with the surprised when she died. As an episode in general, “Breadcrumbs” was disjointed; the themes of the plot is a bit hard to digest. Some subplots are cool in a sense but if you’re looking for actual plot lines, it was very difficult to follow. That being said, Tilly’s parts were rather enjoyable. It’s interesting that Smee and Blackbeard haven’t agreed a day and yet they are both Wish Realm characters and should be old and grey as the only one who was aged down was Nook as we saw in episode 7×02 A Pirate’s Life. Also, I’m pretty sure Blackbeard should be Whitebeard by this time. Confused about the timeline as we are? Check out our timelines page where Keb does a great job trying to fit everything together! “Breadcrumbs” was a little bit boring and clichéd, save for the end. It was adorable that they were trying to set Henry up like he was a 10-year-old. And although they spent too much time on the set up, we liked the twist in the end, as well as the last scene of the ruse. We loved Henry’s proposal to Ella, plus when he realized that he doesn’t have to be this big, famous hero. I don’t know how my story goes, I wasn’t born in a land with magic and I may not get a fairy tale life with a perfect ending. But you are the best and bravest woman that I have ever met and if you could make a leap of faith with me, I would like to build a house right here for the two of us and see what kind of a life we can make together. It is just a pretty ring. And just like this lake it doesn’t come with anything else. Ella, I can’t offer you a legend, but I can offer you my heart. And even before Henry’s proposal, he said, “I don’t need a great story, I just want a great life; the best life I can make with the people I love”. That’s all most of us can hope for, anyway. It was a pretty good payoff for sitting through another tale of Henry’s insecurity, which we loved. In regards, to your podcast on ”Sisterhood” ONCE333, and on your discussion of the Flynn’s Barcade in the episode, it is a reference to Tron Legacy (2010), in which in the film, Flynn’s Arcade is shown in the beginning and ending of the film and the main character is called Kevin Flynn played by Jeff Bridges. Also the screenplay and story is by Edward Kitsis and Adam Horowitz. Prince Henry of Storybrooke is actually pretty accurate, so it’s a bit confusing why he left in the first place to “find his own story.” Everybody else is a character in someone else’s story and he is the grandson of Snow White and Prince Charming. He also brought the Savior, Emma Swan back to break the curse and fight the final battle. Why does Henry think he needs to realm jump and find some other story book that he thinks he’s in? Is slaying dragons really what the Charmings family does best? Both Emma and David had a great moment slaying a dragon using the same sword, after all. But why does Henry have Charming’s sword? Is it because the family is done fighting? Then again, it would be the reasonable thing for him to bring on his adventure to go find himself. However, Henry rode off to another realm without any sword in hand. Much like how Robin felt the need to uphold her father’s name, Henry is also doing the same thing when in fact, Charming slayed the dragon that he slayed for a very big purpose. Emma also slayed the dragon for an even greater purpose, to get the true love potion that brought magic back in Storybrooke. It’s almost like there’s too much peace now so it looks like Henry’s trying to create drama so he can have that legacy to uphold. In the episode, Henry said, “I trust any Hook to safely pilot any vessel in any realm.” The writers are going to weep when they finally gain the perspective to see what they’ve done to this story. The idea of Once Upon a Time is fantastic enough without bringing a string of multiverse of Hook. Realm after realm throughout the multiverse copy of Hook doing whatever. This is really not a thing that comes into your mind when thinking about a fairytale. It’s one of those moments where we cry a little when thinking of what the show have become. Did Drizella/Ivy report the attack on her, which was how Rogers and Weaver came to investigate the Candy Killer? What was creepy and interesting was Nick’s statement to Henry at the beginning when they were talking and he said that he “tried to land an important client last night and she got away”. It’s so creepy but funny, which was exactly the line that makes us believed that this episode was an Espensode. That being said, although some of the lines were funny and the life lessons are pretty good, this is our last Espensode. This whole thing about Nick/Hansel started out at the so-called crime scene and they talked about how they’ve been to 4 crime scenes, and they’ve not found a hair or a footprint and how meticulous the Candy Killer is, and did Weaver find? An entire copy of Henrys book. Why didn’t they show it to us last week? All of this stuff seems to come out of left field. They could’ve showed us bits and pieces of him dropping the book so that we would know that Weaver is going to find it. Did Weaver plant the book? He probably already knows that he’s Hansel because he’s Rumplestiltskin. The scene with them together with Weaver trying to get Henry was good. But is Hansel truly awake? Is he really Hansel? He matches the description that Gretel gave of Hansel, after all. However, if this is how he was, how Henry could’ve been friends with him for so long? Nick is not magical, so he must have come to Hyperion Heights via the curse. No one who is awake would have a reason to wake him up, so he is still cursed. The curse twisted rather than erased his memory. He remembers Henry as his enemy not his friend. Was Nick made to think he was a serial killer? Does this mean that Jack befriends Henry in the past just to get to the witches, including Regina, Zelena and everyone else? Upon the second watch, it feels like although Nick was starting to act creepy, it doesn’t seem like Henry was in any danger until he started talking about the investigation. And even then, we weren’t sure what would’ve happen if he had just kept acting completely oblivious even when he saw the scarring, which was very coincidental timing. Where did Nick take Henry? Henry talking to Nick about him being Hansel reminded us of Emma’s conversation with Jefferson in “Hat Trick” where she said, “you think you’re the Mad Hatter”. We also loved Henry’s line, “just tell them you’re Hansel. 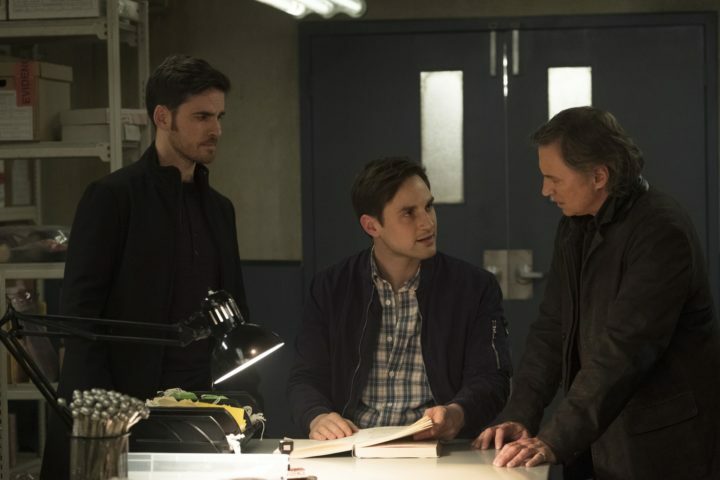 They’ll think you’re crazy, but that could be a good thing for you.” On the other hand, at least we know one thing about the timeline: it’s been about 24 hours since he tried to kill Drizella. There was also some references that pertained to the previous episode happening the night before when Henry talked about his flat tire. Perhaps Henry’s story book just showed up so they can find the killer? Who wrote those notes in the book? What’s going to happen to Henry? Is he going to save himself, or is Rogers going to save him? Will Lucy come to save the day? As for Nick, he sure does look very creepy. He’s good at subtle crazy in the eyes and plays serial killer very well. Meanwhile, in Hyperion Heights, Tilly goes to work. It was cute to show Nook being very much like a father to her, walking her to walk and giving her a job. Their banter was cute, as well as Rogers being quite imperious. We also loved Jacinda asking what Tilly is doing at the Rolling Bayou. Sabine is an awesome boss, asking Tilly to go up front and sell, then later on asked Tilly to give free samples. Maybe she knew what Tilly cooked has the same quality but not the right shape, and they needed to go anyway, so why not just give them away. We liked how realistic Tilly’s advice to Margot was. When you’re in a state that Margot’s in, you might not be as receptive to it but it’s important to remember that, if you’re struggling in a relationship with somebody, probably they’re struggling just as much as you are. We liked that, within the same episode, we saw Margot get to talked down from where she was. However, at some point, they need to stop making her so terrible before they make her good. Not just Margot, but Robin in general because it was so reminiscent of a flashback in Storybrooke when she said that she was a mean girl. The way she talked to her mother, which how families can be so it’s not completely unrealistic. However, her mean can sometimes be over the top, which is very Zelena. The thing is, she doesn’t reminds us of Zelena at all. That said, Zelena/Kelly and Margot had a good chat at the end. The problem with this curse is that it is so wishy-washy. Their personalities have only been altered slightly. Interestingly, Rumplestiltskin was the only one who was given an entirely new identity in both curses. Is Lana Parrilla simply unavailable so they gave Zelena and Lucy some bonding time, which Zelena did a poor job in? It was a good bonding, though; Zelena and Lucy making a glorified vegetable stock. Where was Regina? Why don’t they just look for flowers somewhere near Gothel, instead of having Regina look for a magical moss, or go under the city and look for some kind of crystals? Is there magic in Hyperion Heights or not? If there is, why are Gothel and Anastasia the only ones who can use magic? Why can’t Regina, Zelena and Rumplestiltskin? They have always shown us that there is magic in our world even when it’s called a Land Without Magic. The dragon was in our world and he’s a magical being in a non-magical world; somehow, Peter Pan came and abducted Baelfire from our world. Plus the wishing well, Henry said that we all have magic if we just believe. Even in season 1 they sort of pulled a time travel, when Regina scrounged up magic as she could to reach through Jefferson’s hat to pull the poisoned apple from the moment that she put sleeping curse on Snow White on the episode, “An Apple Red as Blood“. Did they wrote the season just for podcasters that’s why they centered around on Henry’s podcast? Is the job offer fake? Did Nick orchestrate it? He didn’t seem to have any real agenda on Henry until he starts talking about the investigation. Maybe they’ll find out that Nick had a sister who died in his cursed life. The next episode, being the 150th episode, may be a little disconnected with the main story. Regina is MIA and we don’t know how heavily she will be featured in an episode she directed, after all. At this point, we have six episodes left and if the last two are kind of a joint finale and next week is the 150th episode, the next one could still feature the main storyline. However, that only leaves us with three episodes to wrap everything up, unless they save it for the finale. Eddy Kitsis and Adam Horowitz did not write the 150th episode. However, the episode after 7×17 were written by Kitsis and Horowitz. They rarely write an episode that is neither a finale or a premier. It’s too bad Kitsis and Horowitz and Jane Espenson couldn’t write the finale together. What did you think about the episode? Write your thoughts on the comment section below and share them with us including what we missed from the episode. Or simply head over the forum and share your favorite and least favorite moments from 7×16 “Breadcrumbs”, as well as get to know spoilers and other information about the upcoming episodes!